This holiday season is not necessarily a time full of joy and giving for everyone. Some may be grieving and need to have the time, space and support to do so. None of us have put up a single Christmas decoration or played a single Christmas tune in the house and this is perfectly okay. Some are grieving a loved one they have lost or, due to their stage in life, multiple losses of peers contemporary to their age as well as family members. Some may be experiencing a bittersweet last Christmas with someone who may not have long to live. Some may be trying their best to move through the holidays with a condition that incapacitates all efforts to celebrate the way they used to. Some are not able to give of their time, presence or resources because of financial struggle. For the global nomad or expat community, financial difficulty can mean being far away and isolated from dearly loved family members or friends. For my readers who are experiencing any of the above or similar situations, please know that you are not alone. This is my family’s first Christmas without my mother. None of us have put up a single Christmas decoration or played a single Christmas tune in the house and this is perfectly okay. This is just how it happened. I did not plan it, but it was my mom who looked forward to putting the Christmas decorations up and playing the Christmas songs. Growing up as a Third Culture Kid (TCK), there were times when Christmas did not look like a greeting card or the happy endings in Christmas movies. There were years I lived separately from my parents and sometimes only one parent could visit for Christmas until I was old enough to travel by myself for an international holiday visit. The first year I was not together with both my parents for Christmas was my first year as a college student. I was in California and my parents, who were assigned to Bucharest at the time, were travelling between Eastern European countries to get out of harms way during the Romanian Revolution of 1989. They experienced difficulties from a car breaking down after hitting a large deer, to not knowing if they were about to be ambushed, to driving without visibility. They later returned to their residence with the front outside wall of the house riddled with bullet holes and bullet shells scattered across the driveway. I had seen news images of the revolution and damages in the city, not knowing my parents lived in a crossfire, before I knew exactly where they were and before I could even say “Merry Christmas” to them over the telephone (remember, there were no mobile phones, GPS, commercial use of the internet or data plans at the time). Christmas has not always been picture perfect, but nothing prepared me for what I am experiencing as well as what the rest of the family is experiencing. Days are tolerable. I have many funny memories of my mom’s cute and funny statements and ways, but there is a void that will never be replaced. It is a void that I, on a daily basis, intentionally do not let myself drown in because it would engulf me. So it is okay if I do not display the Christmas decorations that remind me of where my mom wanted them placed last year. Even the simple act of acknowledging someone’s loss and recognizing the value of the loss helps greatly. My father has been staying afloat with his faith as his primary vessel, even through the moments he keeps to himself, but, I can tell, are less tolerable. A neighbor who lost her husband several years ago once described the loss of a spouse, different from the loss of a parent, as feeling like a literal “hole in (her) heart.” For my dad, this holiday season involves memories like exchanging simple Christmas gifts and greetings in a car stranded in a blizzard somewhere in Eastern Europe, when the most valuable gift is each other’s life. So it is okay if my dad does not switch the radio to tune into Christmas songs the way he used to every year while my mom was no longer able-bodied. My son also keeps his emotions to himself, but I know he also feels the void and misses his confidante. I am witnessing how he, as a teen, does what he can to be as supportive as possible of his grandfather and mother through this season. His growth into adult years involves the lasting impression if my mother, whom he came to know not only throughout his childhood, but now through the stories we tell about her. So it is remarkable that my teen son even thought of using his hard earned money from his part time job to buy Christmas gifts for us. For my readers who know families who may be experiencing a loss of some sort at this time, I hope you can offer some support. Even the the simple act of acknowledging someone’s loss and recognizing the value of the loss helps greatly. 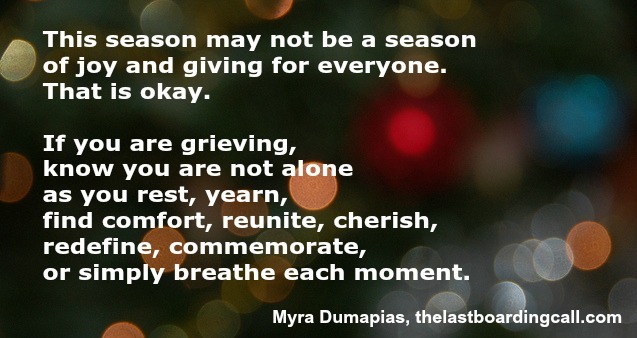 The pace and expression of grief is different for everyone, especially during the holidays. There is no benefit to expecting or pressuring anyone to demonstrate emotional or spiritual strength by acting joyful at this time. There is a difference between letting someone know they are not alone and offering support in the form of company or sharing a meal, and expecting changes as a result of your support. The pace and expression of grief is different for everyone, especially during the holidays. A member of a family that was at least at one point globally mobile can be experiencing more than one of the grief situations I mentioned above. Thus, it is important that we, a community of globe or cross-cultural trotters who most likely have said more goodbyes than we wanted to, honor those who are grieving and the way they wish to grieve this holiday season. This season may not be picture perfect or resemble happy endings in Christmas movies, but it can be a time to reflect back and honor the perfect and happy memories of loved ones. Moments are never repeated again. 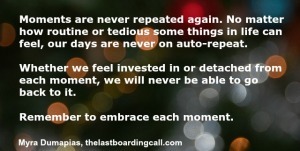 No matter how routine or tedious some things in life can feel, our days are never on auto-repeat. Whether we feel invested in or detached from each moment, we will never be able to go back to it. Taking a mental snapshot of this time when I can embrace both my parents, my son and our dogs. Sometimes it takes a painful looking back at the past to realize things were never the same again. May we all have more of the gift of consciousness of what we’d miss, looking back, in each “now” moment…my hope and prayer for all of you out there this holiday/ Christmas season. Thank you all for reading and following my blog posts.